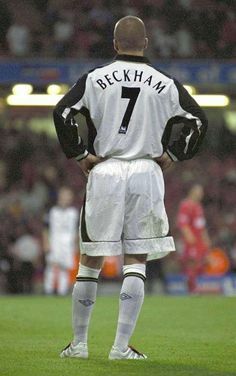 Manchester United entered the 2001/02 season as the three time defending Premier League Champions but Sir Alex was already in the process of building his next team. 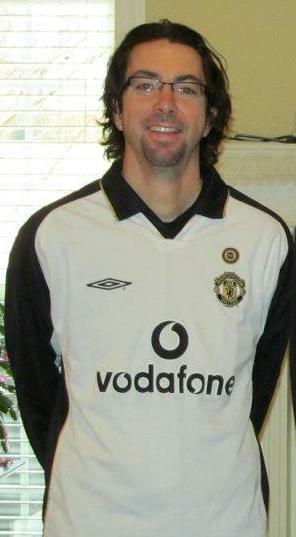 The club added Ruud van Nistelrooy, who scored 36 goals in his first season and would go on to even bigger things the following year, Juan Sebastián Verón and Laurent Blanc with Jaap Stam leaving during the summer and Jesper Blomqvist, Denis Irwin, Ronny Johnsen, Raimond van der Gouw, Dwight Yorke, and Andy Cole gone from the club by the following season. Another league title was not on the cards as poor results in November and December saw the Red Devils in ninth. Results would turn around but Arsenal would eventually win the league and the Double with Manchester United finishing third behind Liverpool. No joy was found in the cups either as Manchester United lost to Arsenal in the Third Round of the League Cup and to Middlesbrough in the Fourth Round of the FA Cup. Bayer Leverkusen knocked out Sir Alex’s men in the Semi-Finals of the Champions League on away goals. Of note this season were two notable comebacks. Manchester United overturned a 3-0 deficit away at Spurs in the league. The Red Devils also rescued a Third Round FA Cup tie at Villa Park with a remarkable three goals in the final 15 minutes to advance 3-2. 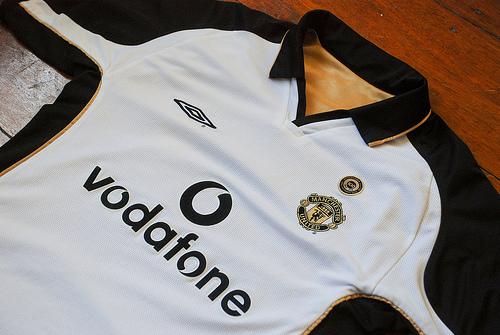 United were one of the leading clubs that attracted considerable criticism for exploiting the replica kit market and in 2001, Umbro came up wih a novel response, creating the first reversible shirt. These were white on one side and metallic gold when turned inside out, so supporters had both away and third shirts in one purchase. The players had separate white and gold sets which were not reversible. The change shirt saw a white chest with black sleeves and panels down the torso. Narrow white trim accent the sleeve from the armpit to the cuff. The shirt used a V neck with a collar, and gold trim was used on the collar and chest. White shorts and socks were used when needed and kept the design element around the rib cage going down most of the shorts. 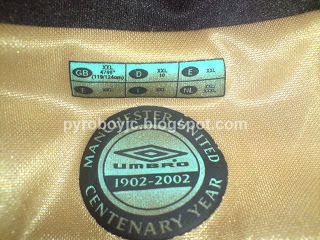 Gold had not used for Manchester United’s kits previously and has not used since, with the yellow shirts of the early 70s being the closest in color. 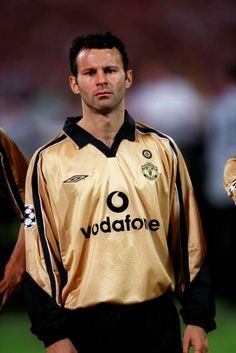 The gold change shirt was in essence a reversed out version of the white shirt, with the same collar, a narrow black band on the sleeves going all the way to the collar, and the black shorts and socks were the same as the change strip. This kit was only worn three times during the season, twice at Arsenal and for United’s away game to Olympiakos in the Champions League. Besides the design, there are also little touches all over the shirt. Let’s start with the badge, with black replacing the red background of the standard badge and gold instead of yellow for the lettering and trim. 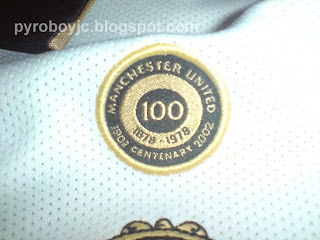 Above the badge is the commemorative mark for the 100th anniversary of the name change from Newton Heath to Manchester United. The inside neck has another mark to celebrate 100 years along with the Umbro wordmark. 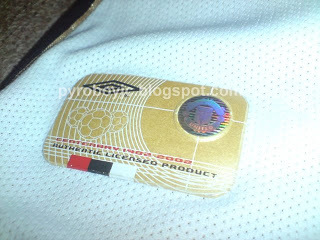 On the front of the shirt is hologram which signifies the authenticity of the shirt, while on the back hem of the change shirt is an element that Umbro used during the early 2000s–the kit life span. Everything on the white side is embroidered while the gold side uses screen printing. While the shirt is heavy due to it being reversible, this is one of my favorites, particularly the white change shirt. The celebratory basis for the shirt is significant as well and glad I pulled the trigger on the long sleeve version all those years ago. Manchester United came into the 2008/09 campaign as the two time defending English Champions and the reigning European Champions, but Ferguson changed up the squad in an attempt to win a massive five trophies. He brought in Brazilian twins Fábio and Rafael to add youth to the defense and Dimitar Berbatov to deepen an already strong front line. 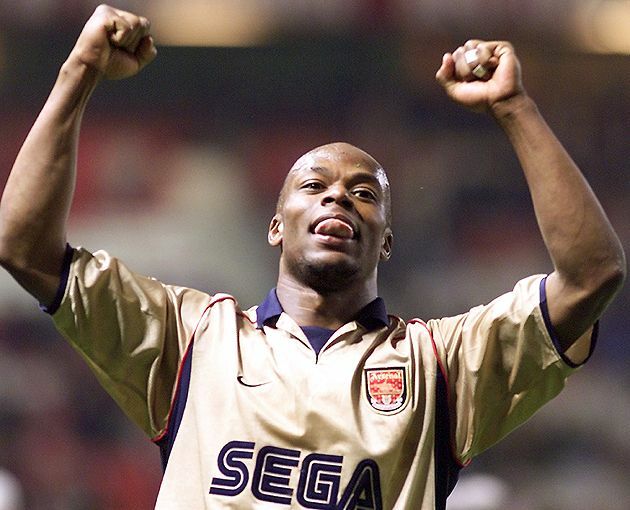 Out went Mikaël Silvestre and Louis Saha. The Red Devils retained the Premiership, using an unbeaten run in the middle of the season, during which they kept 14 straight clean sheets. 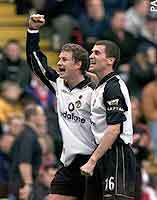 Back to back defeats to Liverpool (their main rival for the title that season) and Fulham saw the Champions’ lead evaporate but Fergie’s Army responded by winning eight of their last nine games, including Macheda’s amazing injury time goal against Aston Villa and a rousing comeback against Tottenham Hotspur. In the end the club secured their 18th First Division title by four points. In the domestic cup competitions, the Reds almost won both, beating Spurs on penalties in the League Cup before falling in penalties to Everton in the FA Cup Semis. Defeat meant that it had been five years since the club won this storied competition. Success the previous season saw the Red Devils play in the European Super Cup and the FIFA Club World Cup. Zenit St. Petersburg upended the Reds 2-1 in the Super Cup while later in the year, the club travelled to Japan for the gathering of continental champions. The Reds defeated Gamba Osaka of the host country in the semis and LDU Quito of Ecuador 1-0 in the Final. In Europe, the club drew their way through a group stage of Villarreal, Aalborg and Celtic. Their reward for winning the group was a tilt against Mourinho’s Inter. A 2-0 win at Old Trafford set up a clash with Porto and the tie was on a knife edge as Porto had drawn at Old Trafford 2-2, but a stunning goal by Ronaldo settled matters, with domestic rivals Arsenal drawn in the Semis. United took care of the first leg and then overran the Gunners in the second leg, going up 2-0 in the opening quarter of hour. Next up was FC Barcelona in Rome and a chance at history. The Blaugrana withstood a furious start by the English Champions and opened the scoring after only nine minutes as E’too stepped inside of Vidic to poke home past Van der Sar. Eventually the Spanish club found their footing and took the game to United in a reversal of the first half. United rode their luck, creating chances of their own, but a Messi goal with 20 minutes to go ended United’s hope of retaining their European crown. With the victory FCB won the Treble and ushered in a cycle of dominance. After the season, Ronaldo went to Real Madrid and Tevez crossed town to City, causing Ferguson to rebuild the squad yet again. The following season, Chelsea would claim the Double. 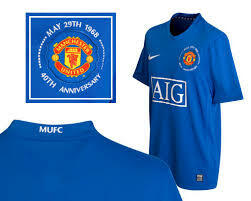 Based on research done by Historical Kits, United wore blue and white vertical stripes as their away shirt starting in 1902, when the club changed their name from Newton Heath to Manchester United. Starting in 1939, the club used an all blue shirt and white shorts until 1957 as their away kit. From there they switched to a white shirt and shorts, with the blue shirt used as a third jersey on occasion (hard to imagine a third jersey used that long ago). For the magical 1968 European Cup Final, Manchester United wore an all blue strip when the club defeated Benfica 4-1 (aet) at Wembley. In my research I found this highlights package of the game, which was in color, the first time I had ever seen the match not in black and white. 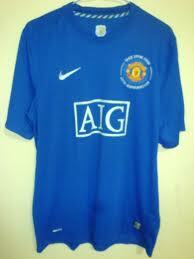 For the next several decades, the club used the blue shirt as an away and third option. 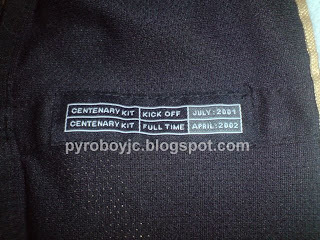 The 2008-09 version is an homage to the 1968 European Cup triumph with the date of May 29th, 1968 and a note about the 40th Anniversary circling the team crest. My wife gave me the long sleeved version of this shirt for Christmas one year and I love it. She even personalized with JUNIOR #7, which is my go to for personalized kits. Although the shirt is only a replica and not the authentic version, it fits nicely and I enjoy wearing it for game days and pick up games whenever possible. One of my favorite shirts and I love the historical reference wrapped up in the kit.